We are pleased to announce that we have chosen the graphic novel March: Book One for Vermont Reads 2019. 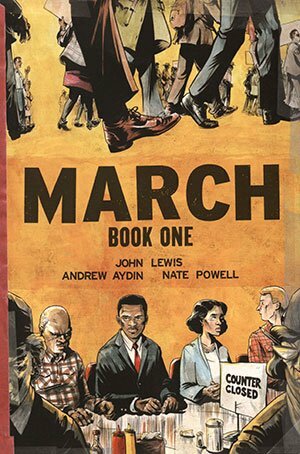 It is the first of a trilogy written by civil rights icon John Lewis, in collaboration with co-writer Andrew Aydin and award-winning graphic artist Nate Powell. Lewis was chairman of the Students Nonviolent Coordinating Committee (SNCC) and was considered one of the “Big Six” leaders of the civil rights movement. He has served in the US Congress since 1987 and was awarded the Medal of Freedom by President Obama in 2011. Book One tells of Lewis’s childhood in rural Alabama, his desire as a young man to be a preacher, his life-changing interactions with Martin Luther King, Jr., and the nonviolent sit-ins he joined at lunch counters in Nashville as a means of undermining segregation. The narrative continues in subsequent books to tell of the 1963 March on Washington (Book Two) and the march across Edmund Pettus Bridge in Selma, Alabama in 1965 (Book Three). All three volumes illustrate the story of Lewis’s commitment to nonviolent protest in the pursuit of social justice. For the first time in the 17-year history of the Vermont Reads program, we have chosen a graphic novel, a format that combines prose with narrative drawing. We think that March: Book One will engage many current fans of Vermont Reads, and also attract a new audience who have not yet participated in the program. 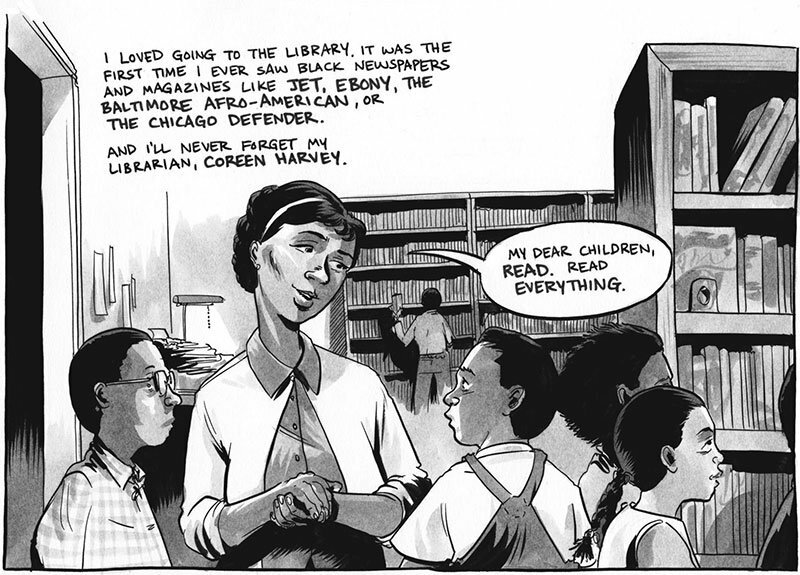 Our hope is that after reading March: Book One, readers will be inspired to keep learning about, exploring, reading, and discussing this seminal time in our country’s history. The Vermont Humanities Council is grateful to the underwriter of Vermont Reads 2019, Jan Blomstrann, and for the support of the Jack & Dorothy Byrne Foundation. Vermont Public Radio is VHC’s media partner; each year VPR presents several days of Vermont Reads programming.